A severely ill 10-year-old girl to whom a US judge granted a prime spot on the adult transplant list despite her youth has received a new set of lungs. Sarah Murnaghan's family said they were "thrilled" the six-hour surgery to implant adult lungs went smoothly and that she had done "extremely well". The family had challenged a US policy relegating under-12s to the bottom of the adult organ donation list. Analysts have warned the judge's decision set a dangerous precedent. The Obama administration declined to intervene in Sarah's case, arguing transplant policy should be made by doctors and scientists rather than the government. Children under 12 have priority for paediatric lung donations, but far fewer paediatric lungs are donated than adult lungs. Sarah's surgery began around 11:00 local time (15:00 GMT) on Wednesday in Philadelphia. "Her doctors are very pleased with both her progress during the procedure and her prognosis for recovery," the family said in a statement about seven hours later. Her aunt Sharon Ruddock told reporters the lungs had been resized to fit her small body, but her recovery time would probably be extensive because the girl had been unconscious and breathing through a tube since Saturday as her condition deteriorated. Complications from lung transplants can include rejection of the new lungs and infection. Since Sarah's case came to light, the national organisation that sets organ transplant policy has created a special appeal and review system for young patients. About 30 children under the age of 11 are on the waiting list for a lung transplant, according to the Organ Procurement and Transplantation Network, out of a total of 1,650 potential lung recipients. Last week, US District Judge Michael Baylson, who is independent of the Obama administration, ruled Sarah and another child at Children's Hospital in Philadelphia, 11-year-old Javier Acosta, eligible for a better spot on the adult list. He found that the US policy amounted to improper age discrimination. Both children suffer from with cystic fibrosis, a chronic lung disease. Sarah's condition had worsened significantly in the last 18 months, diminishing her lung capacity to 30%. 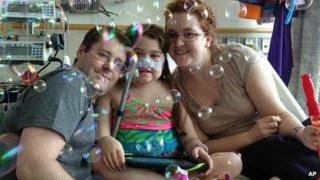 Last month she was admitted to the intensive care unit in hospital. Doctors told the Murnaghans that if Sarah were an adult, she would probably be at "the very top" of the lung transplant list. Ms Ruddock said she was sure that had Sarah not been put on the adult list, "we would have lost her". "She was very close to the end," she said. Some analysts warned the intervention of politicians and judges in the cases would set a dangerous precedent. Dr Arthur Caplan, a bioethicist at New York University Langone Medical Center, said children fared worse than adults after lung transplants, one of the reasons for the existing policy. "In general, the road to a transplant is still to let the system decide who will do best with scarce, lifesaving organs," Dr Caplan said. Before Sarah, only one lung transplant from a donor older than 18 to a recipient younger than 12 had taken place in the US since 2007, according to US government data.